The image above has dynamic HTML content super-imposed on top of a photo, styled using CSS 3D transforms to give the appearance that it is part of the picture. If you are familiar with 3D transforms, you can imagine it would be very difficult to figure out what combination of translate3d(), scale3d() rotate3d() functions will produce the pixel perfect effect needed. I knew it was possible to get exactly the shape needed using matrix3d(), but that it would be a chore to calculate the numbers to do this by hand. For example, for the above example, we need the following CSS to style the digital watch face. Unfortunately, those numbers aren’t the (x,y) coordinates for each of the corners of the transformed box that contains the date and time. They are the values of a 4×4 matrix used in computer graphics to produce 3d effects. 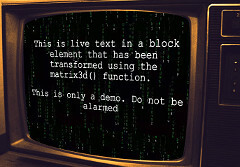 This Matrix Animated GIF is placed as a background image in a DOM element. 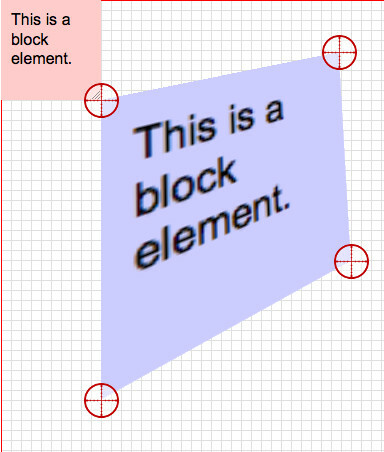 Along with the matrix3d() used to give the illusion it is in the screen, I used a variation of the border-radius trick to make HTML block the shape of a retro TV screen. 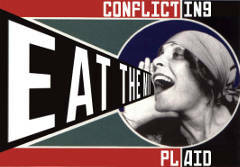 While we are talking about Constructivism, here is a animated version of a potential album cover of my band, Conflicting Plaid spoofing Knigi by Alexander Rodchenko. Note that the Matrix Construction Set has been around for a while for doing 2D matrix()transforms. Over the years, Federico Brigante, Gerard Delmàs and others have requested a 3D version since the 2D matrix() function only allows you to manipulate three corners of a rectangle, while 3D ones allow manipulation of all four. Note also that IE9 and Opera Mini do not support 3D transforms (however, IE9 does support 2D transforms using -ms-transform). In order to handle these browsers correctly, you should either ensure that the original untransformed object is positioned someplace that makes sense without the transform applied (this can be done in the tool by dragging the red object around, which adjusts the object’s transform-origin). You can also use Modernizr to give alternate styles to browsers that don’t support 3D transforms if you want to get fancy. The Matrix Construction Set currently only works on Desktop web browsers, due to mobile browsers lacking support of the HTML5 Drag and Drop API. There is a polyfill that translates drag and drop events to touch events, but unfortunately it doesn’t yet support offsetX/Y and layerX/Y, which are needed for the pixel-precision this tool needs. I may take a stab at adding this feature in the polyfill and updating the Matrix Construction Set with it in a future release. 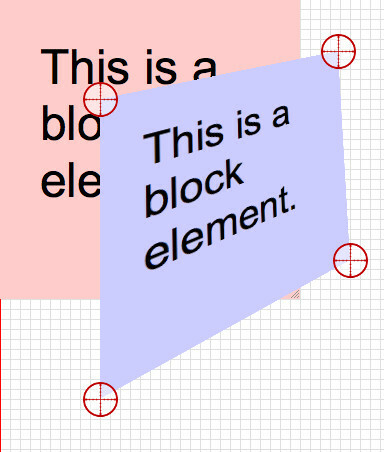 The Matrix Construction Set is not supported in IE10, even though it does support 3D transforms. The code it produces, however, will work in IE10 and above. The tool only allows to insert a small subset of HTML in the transformed object, due to the dangers of XSS attacks by allowing arbitrary HTML. The list of HTML tags supported can be seen in the Sanatize.js recipe that I use to restrict the HTML devs can use in the tool. If you want the tool to support more, please feel free to grab the source of the Matrix Construction Set to add the support you wish on your own web server. If you are really interested in knowing how matrix3d() works, Franklin Ta‘s article Computing CSS matrix3d transforms is a great place to start. 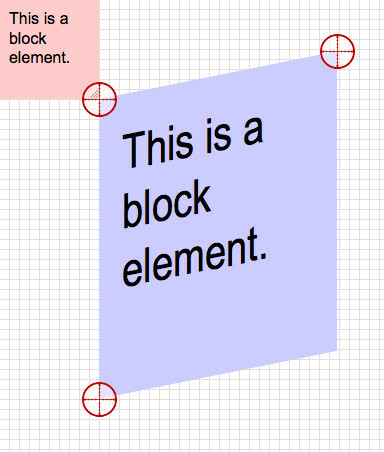 I have previously written an article, The CSS3 matrix() Transform for the Mathematically Challenged, that explains how the math of 2D transforms work. The Google Chrome team's dialog polyfill, for allowing non-Blink browsers to use HTML5 dialogs. Pieroxy's lz-string, to compress HTML and CSS data inside the hash of the tool's URL. Gabriel Birke's sanatize.js to ensure that the HTML stored by lz-string is not vulnerable to XSS attacks. James Coglan's sylverster to calculate the matrix arithmatic needed to calculate the CSS matrix() and matrix3d() numbers. 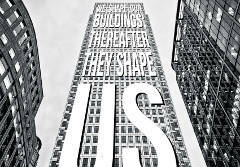 The Matrix Font by Gyusan is used in the header of the Matrix Construction Set. Dude, that’s really cool. I’m going to have try your 3D Matrix Construction set somehow. I’ve pretty much shied away from stuff like that b/c figuring out the coordinates, etc. can be tough… but that watch pic got me thinking.